That particular model is discontinued and it also looks junky, definitely not worth $50. I want an outlet tester with a buzzer for both circuit identification as well as troubleshooting. I want it small and compact so I will always have it with me. Ultimately I would like it to also have a load built into it, something that I can turn on when I want to put a load on the circuit, but I doubt I would ever find that, at least not in a small package. I use a heat gun to test under load. A jobsite radio turned up full blast works if you want to make noise . MechanicalDVR and telsa like this. Why do you need it to have a buzzer? For IDing the circuit from downstairs flipping breakers? 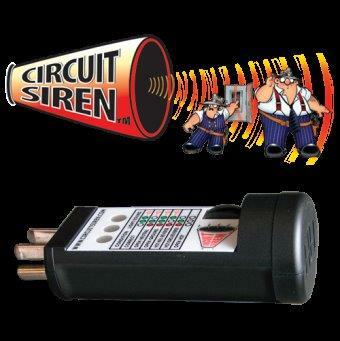 For identification I use a 120 volt Sonalert on a 18' piece os 18/2 SO cord. The one I use has screw terminals that I have doubled up some heat shrink on also used ring lugs for the connection. I also have a a 2 wire female cord end with insulated alligator clips for attaching the sounder to wires. I have been using this set up for years and it works fine. You can get the Sonalert from Newark or Allide Electronics. What tools do I need to carry? Use the NEC as your guide keep all your tools ACCESSABLE but keep your everyday tools READILY ACCESSABLE. Last edited by Lone Crapshooter; 09-28-2018 at 08:57 AM. The heat gun and jobsite radio are two separate devices that are very large and not something I would bring into a quick troubleshooting service call and carry with me all the time. They are the exact opposite of what I asked for, but I figured you would be trolling the second I saw your name. Possibly. More importantly it works well too leave plugged into a dead outlet while working on other parts of the circuit. I’ve thought about something like that very often, but have never seen anything. Haven’t really looked either. I just use my NCVD and rig it to stay in the right place while I do my thing. If the house isn’t too big and is quiet I can usually hear it from the panel too. Yeah, I’ve done that too. And half the time it ends up falling out just enough not to make contact LOL. I saw a little plug-in buzzer at my supply house for $25. If I’m going to carry it I’d rather have it be an outlet tester as well. Not to mention the 30 frustrating seconds it takes to get it to sit just right and then half the time it moves anyway. I’ve never seen even just a buzzer. If I saw one for $25 I’d probably grab it. But I agree, ideally it should be all in one, otherwise it’s just one more tool to carry around, which probably means another trip back to the truck when you realize you need it. macmikeman, MechanicalDVR, HackWork and 1 others like this. Nice! A little big, but it will work just fine. Plug your load into the receptacle below. I don't want to have to carry a second item. How about a heat gun and a kazoo? MechanicalDVR, daks and Max C. like this. I'm always willing to share my immense knowledge and wisdom, Hack. Tie them together with a string and you only have to carry one. Learn how to balance a bucket on your head . You two should get a room together in the Icantread hotel. You should put a cord end on a fire horn. i have always used a tracer. Mine has 2 sender units one for power, one for dead. If i use the live one once i turn the breaker of the sender dies and confirms i have the right circuit. 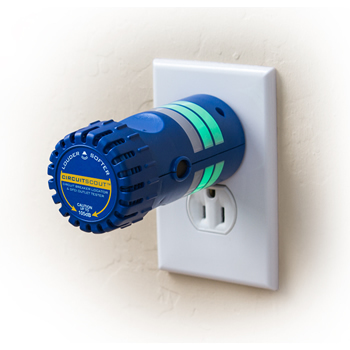 Now a buzzer comes in useful to hook between a breaker and the wire when you are playing find the short.